Culms: Erect to ascending, 12 to 40 inches tall, branching at base, flattened, glabrous, often geniculate, sometimes purplish. Blades: Flat to folded, 4 to 12 inches long and .2 to .5 inch wide, occasionally twisted in loose spiral, glabrous except for scattered long hairs on upper surface close to base. Sheaths: Prominently flattened, keeled, glabrous, often purplish at base; margins not ciliate. Inflorescences: Panicle, dense, stiffly erect, cylindric, 2 to 4 inches long; yellowish at maturity. Spikelets: Broadly ovate, but flat on one side; floret 1, perfect; lemma 1, sterile; 4-12 yellowish-brown to golden-brown bristles at base of each spikelet. Habitat: Waste areas, disturbed sites, cultivated ground, roadsides, and lawns. 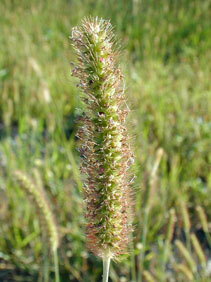 Forage Value: Yellow foxtail has fair forage value when immature. Uses: Birds will consume the seeds. Comments: A common weed that is one of the first plants to appear in disturbed areas. The bristles have been known to cause mouth injuries in livestock.